This homemade egg-free vegan mayonnaise recipe is made with lemon juice, soy milk, and a bit of salt as well as oil, which is what combines to give it that thick and creamy mayonnaise texture. 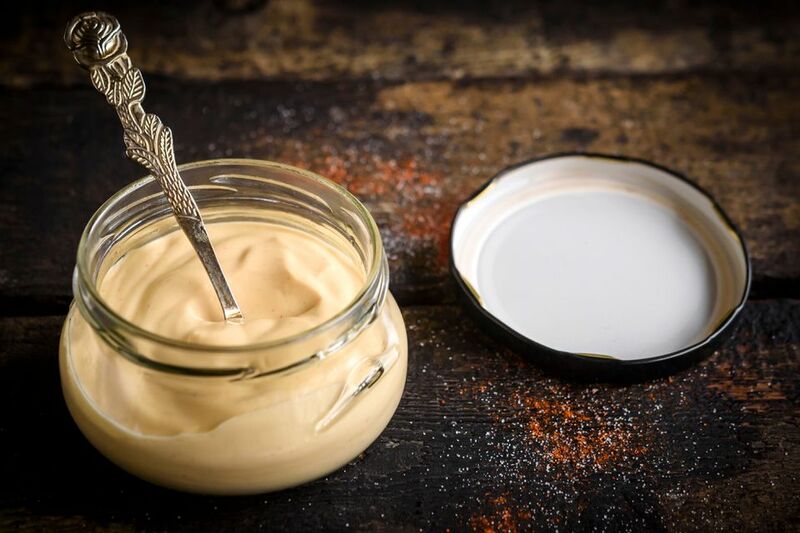 Now that you've got your vegan mayonnaise, you can use it to make simple salad dressings, such as vegan ranch dressing, or a vegan thousand island. Or, use it to make traditionally creamy salads vegan, such as coleslaw or potato salad, or, try something a little bit different, like this summery chickpea salad recipe, or a homemade vegan "chicken" salad. Combine everything except for the oil in a blender. Blend on the lowest speed just until well mixed. Then, very slowly and gradually—just one or two drops at a time—add the oil until the mixture starts to thicken. You can also use a food processor if needed, but you'll have to be patient. Making homemade mayonnaise is easier with a blender or food processor, but you can use a whisk if you need to. Your wrist and your upper arm may get tired from all the manual whisking. Continue blending until the mixture is thickened, creamy and smooth. Note that the mixture will also thicken up a little bit as it chills. Transfer your mayo to a jar and store in the refrigerator. Allow your homemade vegan mayo to chill for at least one hour before you use it. Use on your favorite sandwich and enjoy! The recipe calls for plain vegetable oil, but you really can use whatever oil you have on hand. Just consider the flavor of the oil and how that will affect the flavor of the end product. You can try using olive oil, and it should turn out just as well. Be sure to follow the instructions carefully and slowly add the oil just a tiny bit at a time in order to get it to thicken up properly. If you're struggling to get the mayonnaise creamy, just slow up on the oil, and keep on blending. If you're using a blender which isn't very powerful, or a small low-powered chopper or food processor, you might run into a bit of trouble. You need a very powerful motor in order to really whip the oil to get your homemade mayonnaise thick and creamy like a store-bought mayo, otherwise, it may stay a bit thin and watery. Recipe reprinted with permission from The Compassionate Cook Cookbook.